Behind the Times or Ahead of the Curve? The New York Times recently started advertising some fantastic jewelry. As it happens it is jewelry that we have been carrying for years. I am not surprised that our prices are so much lower than theirs (excuse me while I gloat) judging by the reaction to our shop that we get whenever New Yorkers come through. When New Yorkers come into our shop, there is always a somewhat frenzied reaction. Prices in New York are apparently so high that it is as if The Crown Jewel is a magical wonderland where everything they have ever wanted is here but now just costs less. Of course, Californians buy up all they can at across the border prices-- tax free. When something is $20 it rings up at $20. Then they wait. We repeat $20. "And..." Another wait. "Just twenty." That is equivalent to one Andrew Jackson or two Alexander Hamiltons. Without the pesky Lincolns, Jeffersons, and that guy on the dime. Oh yes, Roosevelt. So I was not shocked when I saw that The New York Times is advertising some of the same jewelry that is carried by The Crown Jewel--but at a pretty penny more. In fact, when I did a web search for others carrying our mobius bracelets, I found that we almost universally had the lowest price. Hmmmn. I will call that a strategic pricing move. Yeah, that's it. 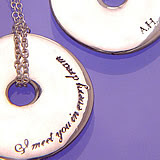 One romantic piece of jewelry (also carried by The New York Times) is a quotation of Alexander Hamilton's. The very same guy on the ten dollar bill. There is something surprisingly touching and unexpected in this quote. And the design of the necklace, with its writing so small that it feels like a discovered secret when you finally read it, lends to its romance. "I meet you in every dream." Now, while I would definitely shop for a crossword puzzle cookie jar at The New York Times store, I would choose The Crown Jewel for those who wish to hang on to their beloved Alexander Hamilton(s). Where Sophisticated Fun Meets Cheap Thrills. We are a family run jewelry and gift boutique in Ashland, Oregon. We've been called everything from "sophisticated fun" to "cheap thrills"-- and its all of the above if you love jewelry, art, and other treasures!